Northern Star does nothing to conceal her innate nature of long range cruiser, showing this quality at first sight. No seeking after extreme forms here, no concessions to fashion but rather the creation, by designer Espen Oeino, of a boat intended for cruising, real cruising, including Atlantic crossings and circumnavigations. 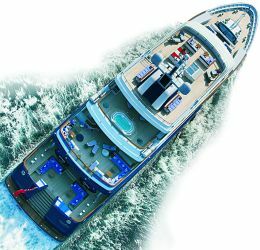 A boat where the design applied on board is also in absolute function of full exploitation of every available interior space, but the decks too really appear to be the very emblem of comfort. This boat which touches 63 metres in length, with steel hull and aluminium superstructure, was built by the German shipyard Lürssen, no newcomer to custom yachts of this size. The owner? A lover of the sea but also of comfort evidently, considering the way his superyacht is organised. Such as the vertical development that characterises her, indubitably, expressed by no less than six decks which announce great interior volumes but also vast external spaces, since each deck has spacious open air portions. Areas whose settings look so welcoming and convivial that they seem to say "come and enjoy the sun". Then there is a Jacuzzi reigning over the area aft of the wheelhouse deck. Yet notwithstanding the sunny external zones this is a vessel perfectly organised to function and guarantee maximum comfort even when sailing in cold climates. This further underlines Northern Star's vocation as a voyager and adventurer in both hemispheres, for long periods at sea far from ports. Also for this reason architect Pauline Nunns, who designed the interiors, wanted to highlight the concept of a boat as stable living place, as a house, proposing the style of the villas that adorn the French countryside: classic, warm, playing on pastel nuance, generally light and sometimes accompanied by upholstery in a contrasting shade. 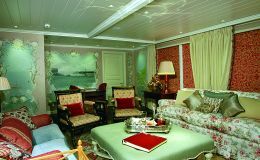 The cabins are predominantly light-blue, green or beige, each with its own individual décor in which meticulous attention has been paid to detail, precisely to recreate that warmth: from the choice of appliqués to the wall fabrics, from the paintings to the cushions, from the doors to the armchairs etc.. 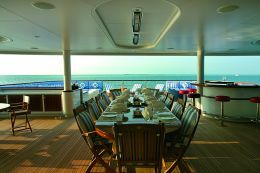 The spaces all seem very large, both the cabins and the shared areas. To obtain this, great attention was paid to reducing as much as possible the number of passageways, corridors and landings so that the whole volume could be exploited for the places where life is effectively lived. 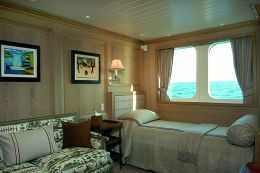 The VIP cabin on the lower deck, which may be used by the owner in particularly rough seas, is very large, and the four guest cabins on the main deck seem especially vast. This sensation is probably emphasised by large windows that give a considerably airy feel as well as splendid views of the sea. 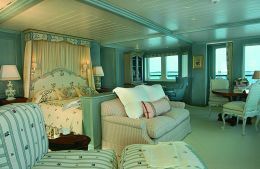 The impression is heightened when you enter the owner's suite, forward on the upper deck, where the bed is oriented in such a way that the panorama can be enjoyed on the three sides with windows. Here too the décor is typically French, with hand-decorated furniture. There are also two bathrooms, one with shower and the other with tub, the latter embellished with mosaics and marble. Particularly welcoming - there's even a stone fireplace - is the panoramic saloon on the same deck, an area created essentially as a meeting place, with super-comfortable sofas and armchairs, ideal for putting people at ease while they converse or watch TV. In accordance with the owner's instructions - he prefers to eat out of doors - the dining area is in the open air, aft of the saloon, in a very vast area with bar and barbecue. 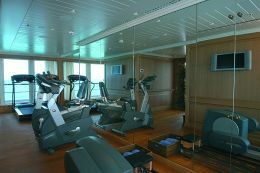 The deck above is the one with the aforementioned Jacuzzi which is an integral part of a well-being area that includes a fully equipped gym. The wheelhouse is forward, dominating the vessel both visually and physically by means of a hyper-technical command bridge, faced in leather. Then armchairs that are almost aeronautical and two dinettes from which the guests too can enjoy the thrills of sailing, perhaps spectacular when the going gets rough. 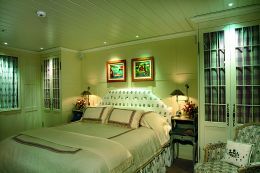 The skipper's cabin, with double bed, is aft of the bridge and communicates directly with his office. 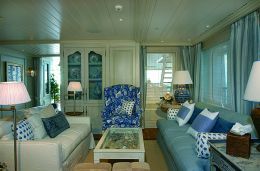 The size and furnishings are fairly in line with the standards of the guest cabins. 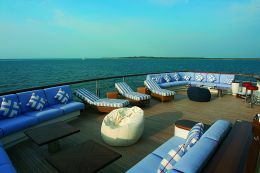 The sun bridge above has a sundeck, sofas and sun-beds, ideal for tanning enthusiasts. Returning to the main deck, two decks below, perhaps using the lift, we come to a very vast space. This includes the indoor dining area with a table seating ten, but given the occasional nature of its use Pauline Nunns decided to set aside an equal volume of space as a peaceful, secluded room for reading or doing business. So there are highly welcoming sofas and armchairs. 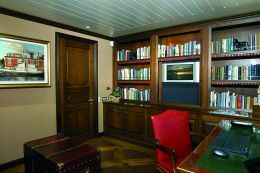 From this area there is access to the owner's office, which has a private bathroom, and to the VIP cabin on the lower deck. 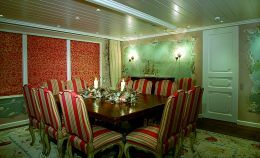 With regard to the crew deck, the quarters consist of no less than eight cabins, all with private bathroom, plus a large mess and, next to it, a perfectly equipped professional galley. The pantry, fridges and freezer are below on the tank deck. As for tenders, Northern Star has two: one of 8.10 metres and one of 8.50 metres, both stowed on the main deck, covered by the structure of the upper deck and handled by means of a mechanism that opens the ship's sides. There is also a 4.50 metre boat stowed forward, plus several jet-skis.